Over the past century, democracy spread around the world in turbulent bursts of change, sweeping across national borders in dramatic cascades of revolution and reform. Aftershocks is the first book to offer a detailed explanation for this wavelike spread and retreat—not only of democracy but also of its twentieth-century rivals, fascism and communism. Seva Gunitsky argues that waves of regime change are driven by the aftermath of cataclysmic disruptions to the international system. 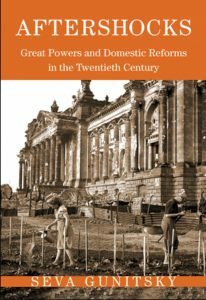 These hegemonic shocks, marked by the sudden rise and fall of great powers, have been essential and often-neglected drivers of domestic transformations. Though rare and fleeting, they not only repeatedly alter the global hierarchy of powerful states but also create unique and powerful opportunities for sweeping national reforms—by triggering military impositions, swiftly changing the incentives of domestic actors, or transforming the basis of political legitimacy itself. As a result, the evolution of modern regimes cannot be fully understood without examining the consequences of clashes between great powers, which repeatedly—and often unsuccessfully—sought to cajole, inspire, and intimidate other states into joining their camps.